Leaving behind a failed career as a magazine editor and an embarrassing stint on a reality baking show, newly divorced lifestyle entrepreneur Hope Early thought things were finally on the upswing—until she comes face-to-face with a murderer . . .
Food and lifestyle blogger Hope Early is settling back into her home town of Jefferson, Connecticut, and she is enjoying reconnecting with family and friends. One chance to do that is at her friend’s garden party to celebrate that friend’s new gardening book. However, Peaches McCoy, an ambitious real estate agent, crashes the party. Peaches isn’t well liked in town, but Hope is surprised to find Peaches’ body before the event is over. With the police zeroing in on Hope’s sister, Hope sets out to find the real killer. Can she do it? This book doesn’t waste much time before jumping into the garden party. That’s both good and bad since it means it isn’t long before Peaches dies, but it also means we meet the suspects and series regulars in a hurry. It took me a little time to keep them all straight, but as their personalities came through, I was able to remember who they all were. The plot does slow down in the second half, but everything comes together for a great climax. This looks like the start of a fun series. The Uninvited Corpse by Debra Sennefelder is the first novel in Food Blogger Mysteries. Hope Early lives in a lovely farmhouse in Jefferson, Connecticut where she writes her blog, Hope at Home. Hope is off to attend Audrey Bloom’s book signing and garden tour. Claire, Hope’s sister and a local real estate agent, insists on coming with her in the hopes that Peaches McCoy will be attendance. Claire is upset that Peaches, a rival real estate agent, stole another listing from her and this one was for the controversial new Whitcomb development. The event is to promote Audrey’s new book. Hope, who just cannot help herself, is cleaning up after the guests. She goes into the study and finds it in a disarray with Peaches dead on the floor. Detective Sam Reid zeros in on Claire as the killer. With encouragement from her friends since she has always been good at solving mysteries, Hope delves into the case. The next night Hope receives a call from Vanessa stating she needs to talk to her right away. Hope arrives at Vanessa’s house to find the door open and Vanessa dead. What did Vanessa know that got her killed? Hope needs to expose the killer before Claire ends up doing twenty to life. Someone is unhappy with Hope’s snooping and attempts to put her out of commission. Can Hope reveal the killer before Claire is fitted for an orange jumpsuit? The Uninvited Corpse is easy to read (I am starting with the positive aspects). I wish, though, that the author had taken the time to establish Hope’s background. We are told what happened to her recently and why she has moved to Jefferson to start over (several times), but I wanted to know more about her. The Uninvited Corpse starts off with the author introducing us to a plethora of characters. There was just one after another and it was difficult to keep them all straight. My favorite character is Jane Merrifield, a mystery writer. I wish the author had made her the main character (I really liked her). The book seemed disjointed/choppy. It lacked an ease and flow. There is the cliché nasty detective that frequently reminds Hope to quit investigating. As an investigator, Hope is severely lacking. She was good as a teen in solving mysteries as a part of a library group (which we are told many times), but that was in theory (like me solving cozy mysteries). Hope asks bad questions and lacks subtlety. She goes around antagonizing people all around the town (she was relentless). I am curious if anyone else wondered why Claire never had dinner with her kids? There was a repetition of information. The same details are mentioned repeatedly. And let me not forget the love triangle. Why do author’s keep putting love triangles in cozy mysteries? The mystery was simple and easily solved. The why takes longer to become apparent. When Hope is not out investigating, she is baking, painting, cooking, chatting, writing blog posts and cleaning (a bit obsessive about it). 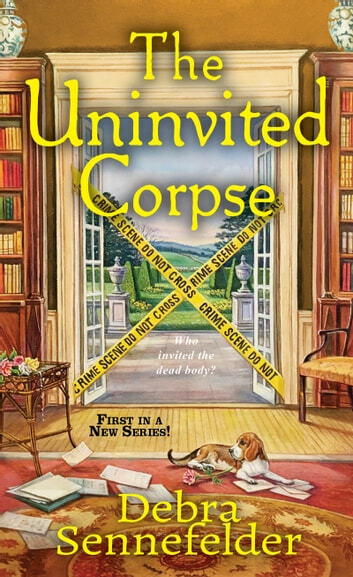 Since The Uninvited Corpse is the first book, I am hoping Debra Sennefelder will work out the kinks before the next Food Blogger Mystery. I am giving The Uninvited Corpse 3 out of 5 stars. I really enjoy The Uninvited Corpse but I didn’t love it as much as I expected. The main character was great as were couple of her friends and the mystery was outstanding! I did not come close to figuring out the murderer. I enjoyed watching Hope work and seeing the way she integrated the blog into her life. She was a kind and well-rounded person although a bit nicer than some people deserved but that is ok. The only thing that bothered me was the fact that there were so many negative people in her life; even her relationship with her sister, whom she loves, is irritating. I thought the book was going to be a cozy mystery and to me good people and warm relationships are a key element that I look for in a cozy mystery so if that is lacking, a book that is excellent in all other aspects will not be great to me. If I had just expected it to be a female amateur mystery, I might have felt differently about the whole book. It was good enough that I want to read the next few so Debra Sennefelder and Hope are still on my list and I want to see more of Ethan. I was excited to receive an advanced reader’s copy of the book from Kensington via NetGalley. I think most readers of amateur mysteries will enjoy the book. I hope that the picky point that bugged me will not bother others reader because I will be recommending it to my friends with that one caveat. 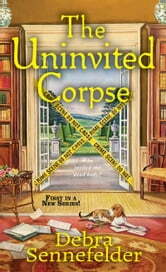 THE UNINVITED CORPSE by Debra Sennefelder is the first book in the Food Blogger Mysteries series. It’s the story of Hope Early who is trying to turn her life around. After three rough bumps in her life – ended career as a magazine editor, embarrassing time as contestant on THE SWEET TASTE OF SUCCESS cooking reality show, and getting blindsided by a cheating husband, she leaves the big city for her home town Jefferson, Connecticut to write her own blog, HOPE AT HOME, with helpful household hints and tried and true recipes. Things get exciting when Hope is the one to discover the dead body of Peaches McCoy, local real estate agent, at the spring garden tour. Peaches hadn’t been invited. Of all the people she has ticked off in town, who had been upset by her arrival? Claire Dixson, Hope’s sister was Peaches professional competitor and had made no bones about her distain for her rival. After Hope’s sister is suspected and later arrested for Peaches murder, Hope knows she has to find the true killer and exonerate her sister. Seems the police don’t see a reason to explore other suspects since they’ve already solved case. Hope’s digging for facts leads to several reasons why Claire might have wanted to kill Peaches. Because of her loyalty to her sister, she knows someone else committed this murder. After, the second murder, she knows that she must be on the trail to the murderer and realizes that her own life might be at stake in finding the truth. This hunch proves true on more than one occasion. With Peaches being so unpopular in town the list of suspects is many and it was fun to see how Hope explored them all. I loved the way the story was laid out, the exploration of leads and then the final surprise ending. I would definitely recommend this book as a new series to start reading if the first book is any indication of what is to come. It will be exciting to see how all the characters develop as this series continues. The relationship between Hope and her dear friend, Chief of Police Ethan Cahill, will definitely be one I will be watching in the coming books. Love the recipes in the back of the book that were used in the story. Definitely plan on trying some of them! Hope Early is a food blogger in Jefferson, Connecticut. Having been the runner up in cooking show she has a small level of notoriety in the foodie world and is working hard to establish her blog and brand. When invited to a garden tour for a book signing at Audrey Bloom’s house, she and her sister arrive to find local realtor Peaches McCoy has crashed the party, which is typical for her personality of stirring up trouble and pushing the envelope. When Hope finds the body of Peaches and her sister Claire is the prime suspect, she needs to add solving a murder to her already burgeoning list of things to do. The book was an engaging read with well developed characters and a plot that kept me turning page after page to find out who had done it. The first book in the new Food Blogger Mysteries, this promises to be a great new series!